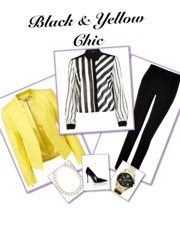 Nappturally Chic Jeré: OOTD- "Black & Yellow Monae Chic"
OOTD- "Black & Yellow Monae Chic"
There is something so clean about a black and cream outfit... It is always on trend, always appears polished, and always appears fashionable. I paired my black skinny legged trouser pants(purchased at Charlotte Russe, about a year ago) with a black and cream striped detailed button up blouse(Purchased at Forever21 a couple of months ago). I was satisfied with the look but the addition of the bright yellow open lapel and structured blazer gave my look a feminine tuxedo inspired flair. Instead of adding a bow tie, traditional seen with tuxedo inspired looks, I opted for a gold necklace strategically placed around the collar of the blouse. This look was definitely inspired by the beautiful, Janelle Monae. I used the complimentary and attention grabbing color of yellow to make this look uniquely mine. 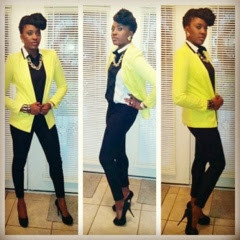 The Exact blazer worn in my outfit. I purchased my skinny leg trouser pants a year ago, but you can find a similiar pants here.